Living in the bush, this is the time of year when we appreciate how puny we really are. One strike about five kilometres North North East of the camp (and high-fuel zones) did however cause anxiety. Fortunately the Department of Fire and Emergency Services aided with the logistics and costs of a chopper, enabling Bob and Chris to fly out some volunteers. Thank you ever so much: Gavin, Lewi, Christian, Aaron & Dean! 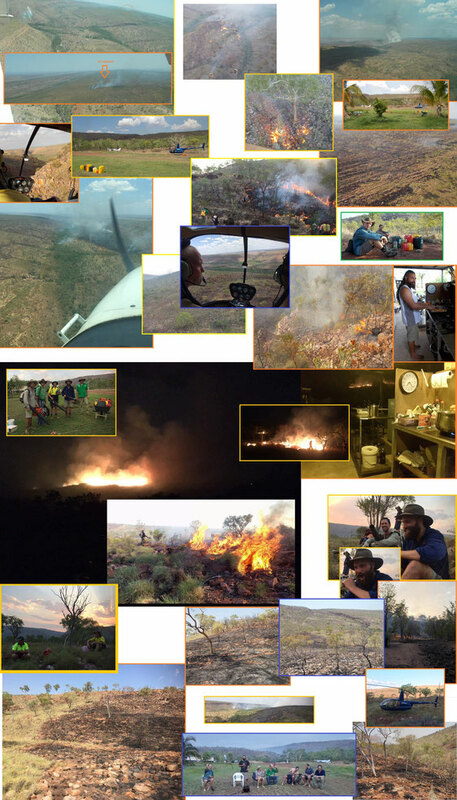 Thank you DFES! Thank you Bondy! Your help was more than just a morale-booster for the home-team which at the time consisted of Nadia, Adrian, Yannick, Bob and Chris. We managed to contain the eastern and western fronts closer to base. To deal with the southern front we ended up back-burning from our last line of defence. Fortunately the wind (which was against us at the time) was not all that strong. Northern fronts we had to let go… some of these then joined up with fires lit by other lightning-strikes. 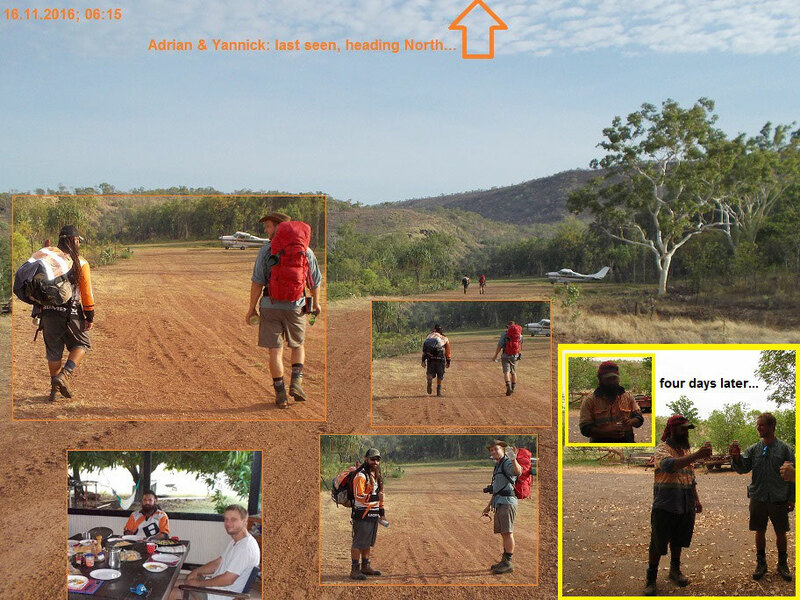 Yannick and Adrian postponed their walk to El Questro until all was safe at our end. Sugar-glider. 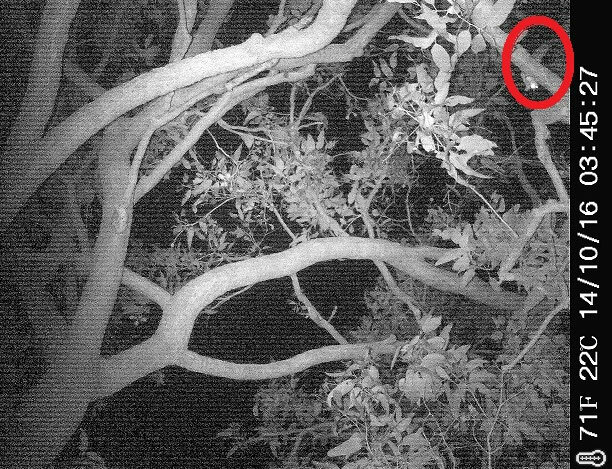 Yannick was able to capture one image of a camera-shy glider. Thank you Mirinda for the loan of your camera-trap! We wish you and your loved ones a reflective time of Advent and the blessings that come with the message of Christmas. Link of the Month: Thank you Todd and Judy for amplifying our message! Chris’ comment: Judy’s interpretation of our achievements on Kachana is most generous… some might say exaggerated! Yes, we are making headway in areas that we manage. Yes, we are running ten times as many stock, BUT only in the comparatively small area that we manage (so all in all, not that many cattle – however native herbivores are taking up the slack which is great). BUT there is only so much that passionate individuals or groups of dedicated individuals can achieve on their own. An effective turn-around at landscape levels requires the type of community support that brings with it assistance from the economic engine that drives commerce. On Kachana after an uphill battle of close to thirty years (fought with the support of only a handful of people who believed in us) our results are such that we are now beginning to get public support. May that support continue to grow so that we can begin addressing landscape restoration and rehydration at the scale in which it is required. Important reading/viewing: This is a relevant perspective for everybody who purchases food (22 minutes). It begins by jumping around a bit to outline a bigger picture. Soon it reverts to practical real-life coverage of how we (the consumers and producers) can influence landscape out-comes that benefit all.